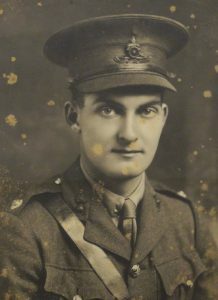 Lawrence Edmund Rowntree of Scalby, Scarborough, was killed in action in Flanders on 25th November 1917, aged 22 years. He was born at York in 1895 and was a grandson of Joseph Rowntree, the Quaker chocolate manufacturer and social reformer of York. 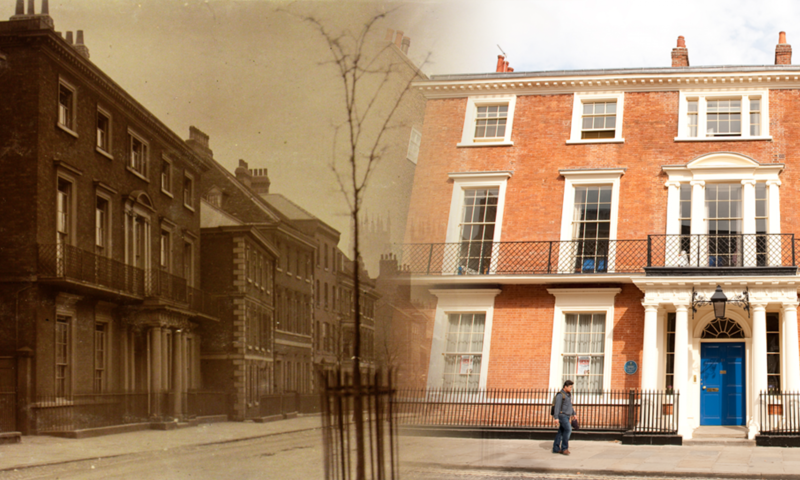 He attended Bootham School from 1907 to 1912. “With two exceptions, there are no original photographs, and in most cases we should have liked to see more illustration, either in pen and ink sketches, or pencil drawings. In 1911, Lawrence was a curator of Astronomy and a librarian for the school Natural History Society. 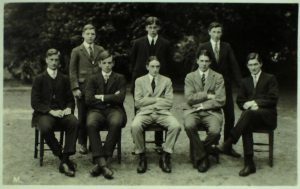 By The 1910-11 season, Lawrence was playing football in the school second XI and had joined the committee of the Senior Essay Society. “Bootham” of November 1911 reported that Lawrence, amongst others from Bootham, had gained the bronze life saving medal at an examination at the St George’s Baths. 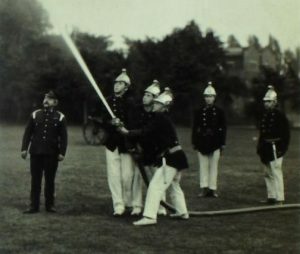 By 1912, Lawrence had become a Reeve at Bootham, equivalent to a prefect. 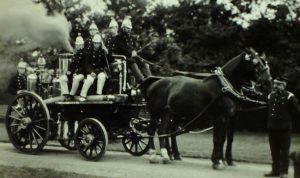 After studying at Haverford Quaker College, Pennsylvania, near where father was buried, Lawrence became a medical student at King’s College, Cambridge in October 1913 but left in 1914 at the outbreak of the war to join the Friends Ambulance Unit. He trained at Jordans, the Quaker Centre in Buckinghamshire, and on 31 October set off for France led by Philip Noel Baker (another Bootham Old Scholar). Lawrence took his grandfather’s Daimler abroad with him, to his grandmother’s disapproval. The December 1914 edition of “Bootham” has a report on the Anglo-Belgian Ambulance Unit and Lawrence is listed under a section entitled “Dressers, Orderlies, Ambulance Drivers, Stretcherbearers, etc.” While in France and Belgium he wrote a diary, entitled ‘A Nightmare’. The original is in the library at Friends’ House in London, and a copy in the Borthwick Institute, York University. During 1916, Lawrence left the Friends’ Ambulance Unit and enlisted in the Army in the Motor Machine Gun Corps, “C” Company of the newly-formed Heavy Section, later known as the Tank Corps. He was posted to the Somme in France. All the tanks in the British Army were at Ancre in the first ever tank battle. Lawrence was injured and while home recuperating decided to apply for a commission. He was accepted and became a 2nd Lieutenant in the 26th Army Brigade, Royal Field Artillery. It was at the Battle of Passchendaele, the 3rd Battle of Ypres, that he was killed in action, on 25th November 1917. “L. E. ROWNTREE. His friends will perhaps remember Lawrence Rowntree best when he was at home. No form of outdoor life came amiss, and he entered with equal zest into any of the many recreations he liked. Motor-cycling was one of his great hobbies, but whatever the accident or however untoward the incident he always kept on smiling. Indeed, it was his unfailing cheerfulness, a fund of good stories, and his constant thought for others that made him such an excellent companion. -He was a Reeve during his last year at school, and, besides winning a much-contested place on the 1st Football XI., he took a prominent post in the Essay, Debating, and N.H. Societies. Many will remember the time and care he lavished on a hydroplane which he built in the workshop, but which, alas!, would not float. Some will know John Drinkwater’s lines in “The God of Quiet ” : ” And the hate Of blood for blood, and bone for bone, can find No habitation in the quiet mind. . . . ” Probably all Old Boys have this quiet mind. 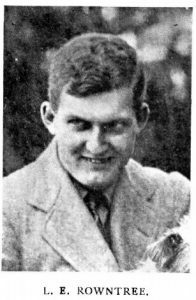 Lawrence Rowntree certainly had it in a large degree, and as his friends are realising how much a part of their lives he was they are also realising how irreparable is their loss.